This mode allows you to play against a fake opponent: the Automa. While you play according to the standard game rules, the Automa follows more easy rules, so you don't spend much time to move the Automa, you must not create strategies for the Automa and you can focus on your game only. You need the standard game and the Automa deck: 20 cards reported here below. NOTE: if you are going to play in EASY mode, skip the rules included in this box. Take from the staff deck all assistants with final game effect. Shuffle these cards and draw the first five. Don't watch them. Set these 5 cards in a separated deck near the Automa's hotel. Then re-insert the remaining staff cards in the common staff deck and shuffle it. 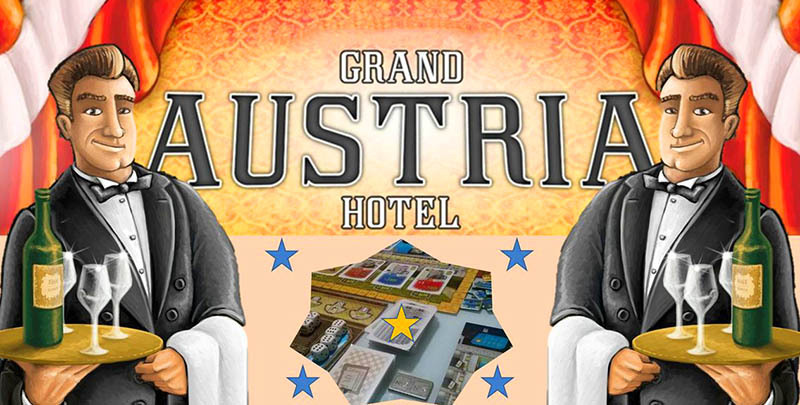 Shuffle the automa deck and place it near the Automa's hotel. The Automa doesn't take the initial guest. Choose randomly the starting player. EASY: don't apply the icons of the automa cards within square parenthesis. During the game ignore all assistants icons. NORMAL: don't apply the icons of the automa cards within square parenthesis. HARD: apply the effect of all icons shown on automa cards. needs no money to acquire new guests or to open new rooms. fulfills immediately all guest requests without managing the cubes. doesn't need to open a new room before to put a guest inside. doesn't gain any victory point for completing the blue regions of his hotel. The Emperor's bonus/malus doesn't affect the Automa. On each automa card all actions taken by Automa are shown. So, for each game round you must draw 2 automa cards and apply the effects of the depicted icons. Draw an automa card at the beginning of each Automa's turn. Once the automa deck is finished, reshuffle it. The first icon indicates the guest color taken by Automa. Ties are broken by taking the guest providing the most victory points. Further ties are broken by looking the tabletop with the order indicated by the hand icon and taking the first guest with the specified color. The second icon indicates the die taken by Automa. If two dice are depicted, the Automa takes the die from the area where there is the greater number of dice. Ties are broken by following the hand icon direction. 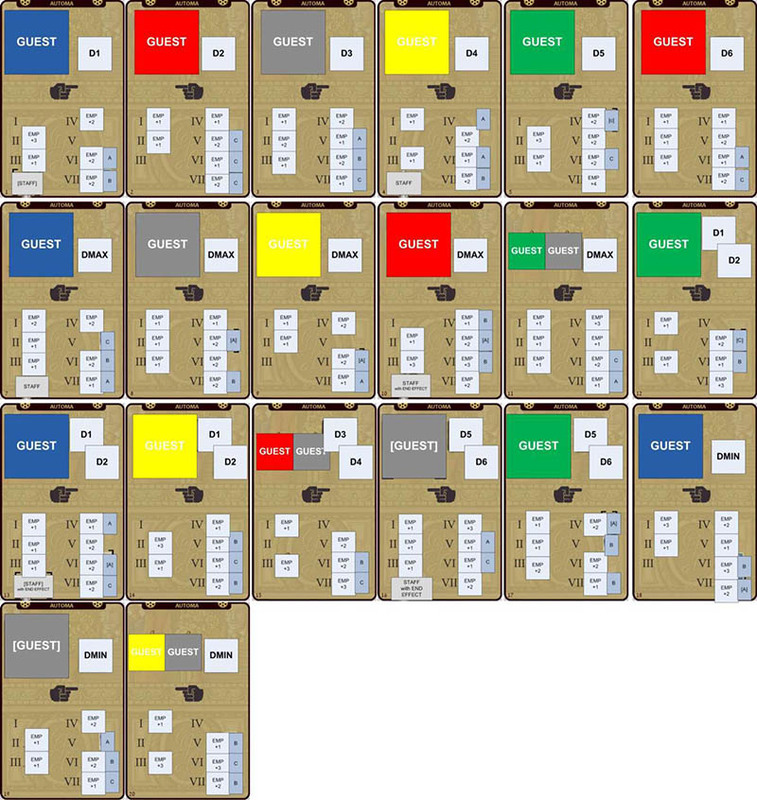 If the Automa's hotel has no free spaces with the color of the guest which would be taken by the Automa, discard the current automa card and draw a new one. 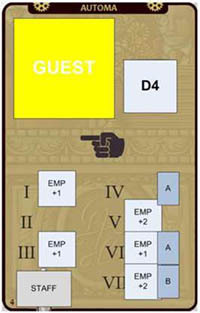 Just after the Automa acquires a guest, he gains the related victory points (if any), then he places him in the hotel by placing the corresponding closed room tile. Further benefits depicted on guest card are never applied. The Automa shall not pay to place a room tile. The Automa shall not respect the limit on the rooms adjacency and he is not obliged to place the first room in the bottom left corner. When the Automa places a tile on a room having victory points symbol, he gains immediately these victory points, as for a normal player. 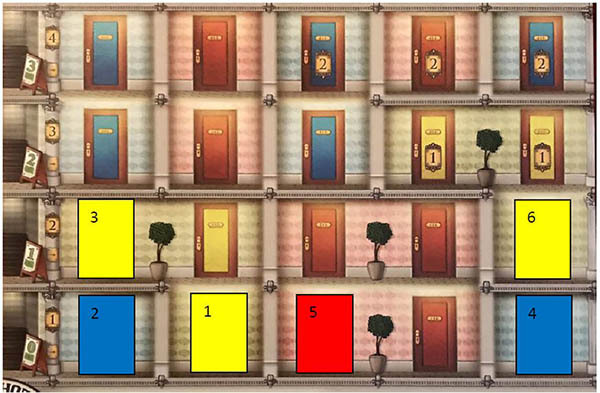 Example: if the Automa takes these guests in the reported order: 1-yellow, 2-blue, 3-yellow, 4-green, 5-red, 6-green. The hotel will be set as in the picture. How much Emperor points the Automa gains. The Automa gains immediately the Emperor points amount according to the current round number. If the Automa fulfills an award.. If an award icon is depicted near the round number corresponding to the current round number, place an Automa's marker on the awards A/B/C indicated by the card and gives to the Automa the related victory points. If the Automa already satisfied the award, ignore this action. If the Automa hires an assistant.. Regardless to the current round number, if the automa card shows an assistant, draw an assistant card from the common staff deck and gives him to the Automa. If the automa card shows an assistant with end game effect, draw a staff card from the Automa's private staff deck. Example: if you are playing the round number 6 and the Automa draws this card, the Automa gains 1 Emperor point and he fulfills the award A. So he gains the victory points of the award (unless he already satisfied it). Finally the Automa hires a new assistant by taking a staff card from the common staff deck. During the Emperor phase the Automa gains the victory points according to the position of his marker, as a normal player. The Emperor benefits and punishments don't affect the Automa's game. The Automa's final score is made by the points gained during the game, by the points provided by the room tiles and by the assistants with end game effect (if Automa has some of them).